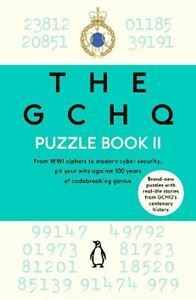 The first book from GCHQ took the UK by storm as the leading intelligence and security experts tested us with puzzles, codes and challenges from their top-secret archives. Now, they are back with a new collection of head-scratching, mind-boggling and brain-bending puzzles that will leave readers pondering for hours. For those who often found themselves stumped with the first book, there will be even more starter puzzles to get those brains warmed up. Puzzle aficionados needn't worry either as there will also be an 'Even Harder' section to test them to their limits. In celebration of GCHQ's centenary in 2019 the puzzles will be structured around vignettes of history from the organisation's archives. These will give exclusive snapshots into the organisation that keeps up all safe, making it a book to treasure.